Instead of throwing away the house hold waste, it can be used to prepare the compost barrels which are used to grow plants. Materials like coffee ground and filters, leaves, grass clipping, egg shells, nut shells, shredded newspapers, fireplace ashes fruits and vegetables etc. can be used for composting. The composting waste adds vital nutrients to the soil and it helps in the growth of the plants. Composting in a barrel is a quick process and the composting can be done in very short time. Compost barrel can retain moisture much better than an open pile can, there is less need to add water to the composting barrel. The compost barrels are compact and they can stand above the ground, by this way it saves a lot of space in the garden. Composting the house hold waste in the barrel reduces the costs and time involved in transferring the waste to the landfills. Compost barrels provides the essential nutrients required by the plants and this reduces the use of artificial fertilizers for plants. 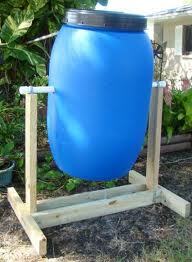 In this way the composting barrels saves the money for the house owner. Composting barrels also saves water as they retain more amount of the moisture when compared to compost pile, pit or a bin. Another benefit you can get by using the compost barrels is that you can educate your children about the uses of waste materials in the house. The above are the various benefits of a compost barrel.